The analysts over at research firm Niko Partners reckon that China's premium games market will hit $1bn within four years. In a post about the sector's future, the company says that the 'buy-to-play' - aka premium - market will almost double by 2022 from the $580m valuation it received in 2017. This is due to a number of factors, the largest of which is Steam officially launching in the region and Tencent ramping up its own WeGame platform. With regards to the first of those factors, Niko says that - despite Valve saying that the international version of Steam which is currently available in China will remain in operation - it remains to be seen what happens to this platform in the region. That being said, users can always turn to VPNs to access. Secondly, Tencent's localised WeGame marketplace - which has already seen titles such as Capcom's Monster Hunter World draw a lot of attention - is only going to grow. "WeGame has already had success with games such as Don’t Starve which has sold over 2 million units in China. Other top sellers include Stardew Valley, Icey and more," Niko wrote. "Tencent is poised to bring more top games to the platform such as Ubisoft’s Rainbow Six Siege as well as a selection of top free to play games such as Fortnite to unite both F2P and B2P gamers on one platform. Games like Grand Theft Auto V, Civilization 6, Rise of the Tomb Raider, H1Z1, Dead by Daylight and Lost Castle have been huge successes on Steam in China. PUBG was the highlight of last year on Steam, helping drive considerable growth. "The competition between Tencent and Valve is only just beginning. Valve is looking to obtain an official presence in China through its partnership with Perfect World. Due to its dominant position on the world stage, most developers and publishers will always look to support Steam first, especially as the international version of Steam is still available to Chinese users. However, Tencent is looking to gain favour with developers and publishers as it expands its store globally and offers a much more streamlined path to the China market as the company is able to leverage its expertise in games localisation, distribution, acquisition and marketing. We will continue to follow the regulations, policy, demand and trends around Steam, WeGame and other B2P channels in China." Emerging markets such as China are just one topic that will be discussed at the forthcoming PC Connects London 2019 on January 21st and 22nd. 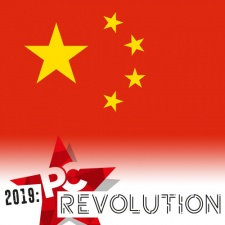 We are already detailing the tech and trends that are going to define the coming years as part of our PC Revolution editorial push - but you can come here more about these aggressive shifts at the UK conference. Tickets available here.